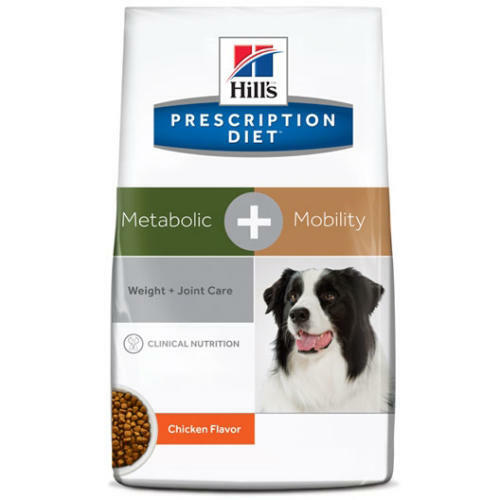 Hill's Prescription Diet Metabolic + Mobility is formulated to help your dog lose weight whilst also working to maintain joint health. Clinically demonstrated to reduce body weight by up to 13% in 60 days, and improve mobility from only 21 days thanks to optimal levels of essential omega 3 fatty acids. Metabolic plus Mobility also helps to keep your dog full between meals thanks to a natural blend of fruit and vegetable fibre. Protein 28.0, Fat 14.6, Carbohydrate (NFE) 36.2, Crude Fiber 14.9, Calcium 0.95, Phosphorus 0.7, Sodium 0.37, Potassium 0.88, Magnesium 0.159, Carnitine 400 ppm, Vitamin C 324 mg/kg, Vitamin E 741 IU/kg, Chondroitin Sulfate 1174 mg/kg (ppm), Glucosamine 738 mg/kg (ppm).